All it takes is one bad day to reduce the sanest man alive to lunacy. That's how far the world is from where I am. Just one bad day. You had a bad day once. Am I right? I know I am. I can tell. You had a bad day and everything changed. Why else would you dress up like a flying rat? Anyhow, She-Bat... you just might get naughty and try to do the old midnight divorce on me, right? So I decided to help myself to your arms and legs, Sweety-Boo. Call it the best pre-nup ever. Haven't you ever heard of the healing power of laughter? Oh, what the heck, I'll laugh anyway. HA HA HA HA HA HAA! Take a hint o'boy. We may have had our differences, but you and me, we're made for each other! I just wanted to bring down your grim faade and for once, let you see the world as I see it, giggling in a corner and bleeding. 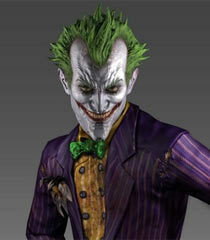 Oh, I'd like to thank my fans for their undying support, and the people of Gotham, who I will be seeing very, very soon.